Background and objectives: The non-steroidal anti-inflammatory drug celecoxib, used for the treatment of senile degenerative knee osteoarthritis, has a rapid onset of action and few side effects. However, it cannot prevent the occurrence and development of knee osteoarthritis. Celecoxib withdrawal is likely to induce a rebound increase in inflammation that may aggravate symptoms. Diacerein is a drug used to improve articular cartilage metabolism. It can delay the progression of senile degenerative knee osteoarthritis, but has a slow onset of action. Whether combined treatment with celecoxib and diacerein provides complimentary actions to achieve a better therapeutic effect on senile degenerative knee osteoarthritis remains unclear. Design: A prospective, single-center, randomized controlled trial. Methods: Three hundred patients with senile degenerative knee osteoarthritis who receive treatment at the Department of Orthopedics, Second Affiliated Hospital of Nanjing Medical University, China will be randomly assigned to the celecoxib (200 mg, once a day, orally), diacerein (50 mg, twice a day, orally), and celecoxib + diacerein (celecoxib 200 mg, once a day, orally and diacerein 50 mg, twice a day, orally) groups, with 100 patients in each group. Patients in each group will be treated for 12 successive weeks, and a 36-week follow-up will be performed. At 24 weeks after treatment, the VAS score for pain during the 20-meter walk test and osteoarthritis index were significantly decreased in the diacerein and celecoxib + diacerein groups compared to pre-treatment (P < 0.01). Outcome measures and preliminary results: The primary outcome measure of this study is the Visual Analogue Scale (VAS) score for pain during the 20-meter walk test before and 1, 4, 12, 24, and 36 weeks after treatment. The secondary outcome measures of this study include osteoarthritis index and X-ray image findings of the knee before and 1, 4, 12, 24, and 36 weeks after treatment, as well as the incidence of adverse events at 1, 4, 12, 24, and 36 weeks after treatment. Preliminary experimental results of 210 patients with senile degenerative knee osteoarthritis who received the same treatment as in the present study revealed that at 24 weeks after treatment, the VAS score for pain during the 20-meter walk test and osteoarthritis index were significantly decreased in the diacerein and celecoxib + diacerein groups compared to pre-treatment (P < 0.01). Discussion: Results from this study will help to determine whether celecoxib and diacerein complement each other to produce a long-lasting, safe, reliable, and rapid-onset analgesic effect in patients with senile degenerative knee osteoarthritis. Ethics and dissemination: This study was approved by the Ethics Committee of the Second Affiliated Hospital of Nanjing Medical University, China (approval No. (2017) KY-091). The study protocol will be performed in strict accordance with the Declaration of Helsinki formulated by the World Medical Association. Written informed consent of the study protocol and procedure will be obtained from each patient. Participant recruitment will begin in January 2018. Sample and data collection will begin in January 2018 and end in December 2018. Outcome measures will be analyzed in January 2020. The trial will end in February 2020. Results will be disseminated through presentations at scientific meetings and/or by publication in a peer-reviewed journal. Trial registration: This trial was registered with the Chinese Clinical Trial Registry (registration No. ChiCTR-IOR-17013867). The selective cyclooxygenase-2 inhibitor celecoxib is the most commonly used non-steroidal anti-inflammatory drug for the treatment of knee osteoarthritis. It carries a low risk of stomach and intestinal adverse reactions and has a rapid onset of action. However, it cannot prevent the occurrence and development of knee osteoarthritis. Celecoxib withdrawal is likely to induce a rebound increase in inflammation that may aggravate symptoms. ,,, Diacerein, a drug used to improve articular cartilage metabolism, can postpone the progression of senile degenerative knee osteoarthritis and can compensate for the drawbacks of celecoxib. However, it has a slow onset of action.,,, Therefore, both celecoxib and diacerein have limited curative effects on senile degenerative knee osteoarthritis when used alone. In this study, we aim to investigate the curative effects and safety of celecoxib combined with diacerein on senile degenerative knee osteoarthritis and to determine the analgesic and anti-inflammatory effects of the combined therapy. In this prospective, single-center, randomized controlled study, 300 patients who receive treatment from clinics in the Department of Orthopedics, Second Affiliated Hospital of Nanjing Medical University, China will be included and randomly divided into three groups: celecoxib, diacerein, and celecoxib + diacerein. These patients will be followed-up for 36 weeks. 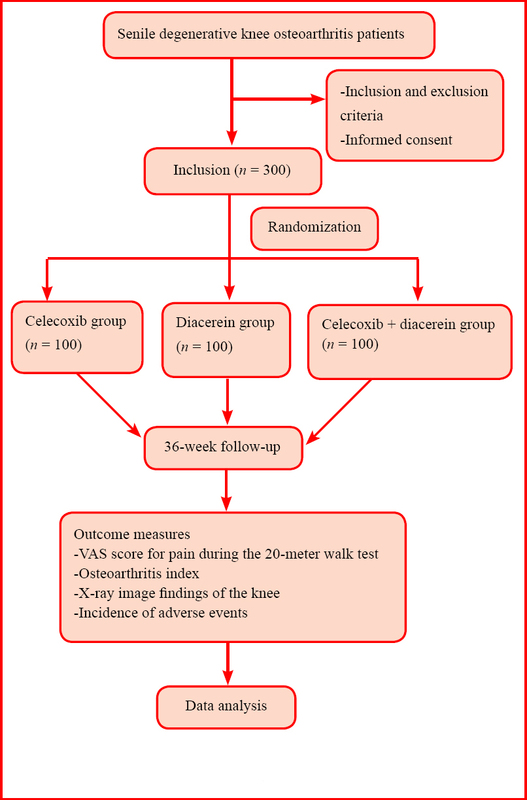 The Visual Analogue Scale (VAS) score for pain during the 20-meter walk test and osteoarthritis index will be determined before and 1, 4, 12, 24, and 36 weeks after treatment to investigate the analgesic and anti-inflammatory effects of celecoxib, diacerein, or their combination, with the purpose of identifying the optimal therapeutic approach. [Figure 1] demonstrates the study flow chart. Note: VAS: Visual Analogue Scale. Second Affiliated Hospital of Nanjing Medical University, China. A total of 300 patients from the clinics of the Department of Orthopedics, Second Affiliated Hospital of Nanjing Medical University, China will be randomly assigned to receive celecoxib and/or diacerein. Patients who receive treatment in the clinics of the Second Affiliated Hospital of Nanjing Medical University, China will be invited to voluntarily participate in the trial after reading the recruitment information on the hospital bulletin board and having contact with the responsible researcher via telephone. Only eligible participants will be included after signing informed consent forms. A table of random numbers will be generated by the first author using SPSS 20.0 software (IBM, Armonk, NY, USA). The included 300 patients will be randomly divided into three groups with 100 patients in each group, according to the table of random numbers. Grouping will be not blinded. (200 mg, once a day, orally) and diacerein (50 mg, twice a day, orally). Patients in each group will be treated for 12 successive weeks. -The VAS score for pain during the 20-meter walk test before and 1, 4, 12, 24, and 36 weeks after treatment. A self-made vernier caliper will be used. It contains two sides. The front side will be labeled with the numbers 0–10, with equal distance between digits. The back side will be segmented numerically (0–10; accuracy in millimeters) as the VAS, with 0 indicating no pain at all and 10 suggesting worst pain imaginable. Each patient will be asked to mark his pain level on the front side. Then, the physician can define the patient’s pain according to the digit on the back side that corresponds with the patient’s marked number. The osteoarthritis index is used to evaluate the severity of arthritis and the therapeutic effect according to patient’s symptoms and signs. It is used to evaluate the structure and function of the hip and knee from the perspectives of pain, stiffness, and physical function. The whole section or portions of it can be selected for use. The VAS score can be used to evaluate osteoarthritis. Higher score indicates more severe osteoarthritis. X-ray image findings of the knee will help evaluate morphological changes after treatment. Incidence of adverse events will be used to evaluate drug safety. The incidence of adverse events = number of patients having adverse events/total number of patients × 100%. [Table 1] shows the timing of measurements of the primary and secondary outcome measures. During the follow-up period, drug-related adverse events, including nausea, vomiting, dizziness, headache, and joint stiffness, will be recorded. The possible cause of adverse events will be analyzed. Data on patient’s adverse events and side effects will be tabulated. The causes and explanations will be reported. These adverse events and side effects as well as their causes and explanations will be reported to the researchers in charge and the ethics committee of the clinical research institute within 24 hours. The study protocol should be approved by the Ethics Committee of the Second Affiliated Hospital of Nanjing Medical University of China, and a protocol agreement should be signed. During participant recruitment, regular audits will be necessary to ensure included participants are eligible, the trial is performed in strict accordance with the study protocol, and related data are complete. At the end of all trial procedures, a final visit will be required to ensure relevant records are complete and accurate. All data will be statistically analyzed using SPSS 20.0 software (IBM, Avmonk, NY, USA) and follow the intention-to-treat principle. Normally distributed measurement data will be expressed as the mean ± standard deviation. Non-normally distributed measurement data will be expressed as lower quartile (q1), median, and upper quartile (q3). Numerical data will be expressed as percentage. Repeated measures analysis of variance will be used for comparisons of VAS score for pain during the 20-meter walk test and osteoarthritis index between pre-treatment and 1, 4, 12, 24, and 36 weeks after treatment. One-way analysis of variance and the Least Significant Difference test will be used for comparisons of VAS score for pain during the 20-meter test and osteoarthritis index among the celecoxib, diacerein, and celecoxib + diacerein groups at the same time point. Pearson’s chi-square test will be used for comparison of the incidence of adverse events among the three groups at the same time point. An α = 0.05 (two-sided) will be used for inspection level. In accordance with our experience, we hypothesize that the VAS score for pain during the 20-meter walk test in the celecoxib + diacerein and celecoxib groups would be reduced by 3 and 4 points, respectively, compared to pre-treatment. Taking β = 0.1, power = 90%, and α = 0.05 (two-sided), the final effective sample size of n = 133 per group was calculated. Assuming a patient loss rate of 20%, we require 160 patients per group. At the end of expected recruitment, at least 100 patients per group will be included. If a patient’s records are lost, the patient will be excluded from this study. Corresponding numbers of new cases will be supplemented. [Table 2] shows baseline data of patients who will be included in this study. Researchers will complete the case report form for each case. After the completed case report form is reviewed by an inspector, data input and management will be performed. After data transfer, contents recorded in the case report form will not be modified. During the clinical trial, sponsor inspectors should conduct regular periodic visits to the research center to ensure strict adherence to all aspects of the research program. In addition, the original data will be checked to ensure that the contents of the case report forms are correct and complete. This clinical trial follows the relevant laws and regulations of the Declaration of Helsinki. This manuscript is prepared and modified according to the SPIRIT (Standard Protocol Items: Recommendations for Interventional Trials) guidelines (Additional File 1 [Additional file 1]). The researchers take the responsibility of providing the independent ethics committee with the clinical trial protocol and informed consent forms and providing patients with related informational materials. The trial will not be initiated until approval from the ethics committee is received. This study was approved by the Ethics Committee of the Second Affiliated Hospital of Nanjing Medical University of China (approval No. (2017) KY-091). There are several limitations of this study. First, outcome measures are relatively simple; second, blinding will not be used; and third, a placebo control group will not be included. All these will influence the accuracy of clinical outcomes and will be addressed in future studies. Preliminary experimental results confirmed that the combination of celecoxib with diacerein for the treatment of senile degenerative knee osteoarthritis is superior to monotherapy in terms of curative effects and safety; in particular, early analgesic and long-lasting effects were observed. In this study, a larger sample size will be included and longer follow-up will be performed to demonstrate definitive clinical evidence to support the conclusion made in the preliminary experiment and facilitate popularization of this treatment protocol in the near future. Uritani D, Fukumoto T, Myodo T, Fujikawa K, Usui M, Tatara D. The association between toe grip strength and osteoarthritis of the knee in Japanese women: a multicenter cross-sectional study. PLoS One. 2017. doi: 10.1371/journal.pone.0186454. Favero M, El-Hadi H, Belluzzi E, et al. Infrapatellar fat pad features in osteoarthritis: a histopathological and molecular study. Rheumatology (Oxford). 2017. doi: 10.1093/rheumatology/kex287. Kuttapitiya A, Assi L, Laing K, et al. Microarray analysis of bone marrow lesions in osteoarthritis demonstrates upregulation of genes implicated in osteochondral turnover, neurogenesis and inflammation. Ann Rheum Dis. 2017. doi: 10.1136/annrheumdis-2017-211396. Frank RM, Della Valle CJ, Plummer DR, Chalmers PN, Cole BJ. Does prior cartilage restoration impact outcomes following knee arthroplasty? Orthop Clin North Am. 2017. doi: 10.1016/j.ocl.2017.03.001. McDaniel D, Tilton E, Dominick K, et al. Histological char acteristics of knee menisci in patients with osteoarthritis. Clin Anat. 2017. doi: 10.1002/ca.22920. Chang NJ, Lee KW, Chu CJ, et al. A preclinical assessment of early continuous passive motion and treadmill therapeutic exercises for generating chondroprotective effects after anterior cruciate ligament rupture. Am J Sports Med. 2017. doi: 10.1177/0363546517704847. Ha CW, Park YB, Kyung HS, et al. Gastrointestinal safety and efficacy of long-term GCSB-5 use in patients with osteoarthritis: a 24-week, multicenter study. J Ethnopharmacol. 2016;189:310-318. Zhang XL, Yang J, Yang L, et al. Efficacy and safety of zhuang gu joint capsules in combination with celecoxib in knee osteoarthritis: a multi-center, randomized, double-blind, double-dummy, and parallel controlled trial. Chin Med J (Engl). 2016;129:891-897.
da Costa BR, Reichenbach S, Keller N, et al. RETRACTED: Effectiveness of non-steroidal anti-inflammatory drugs for the treatment of pain in knee and hip osteoarthritis: a network meta-analysis. Lancet. 2016;387:2093-2105. Lee T, Lu N, Felson DT, et al. Use of non-steroidal anti-inflammatory drugs correlates with the risk of venous thromboembolism in knee osteoarthritis patients: a UK population-based case-control study. Rheumatology (Oxford). 2016;55:1099-1105. Rezende MU, Hernandez AJ, Oliveira CR, Bolliger Neto R. Experimental osteoarthritis model by means of medial meniscectomy in rats and effects of diacerein administration and hyaluronic acid injection. Sao Paulo Med J. 2015;133:4-12. Fidelix TS, Macedo CR, Maxwell LJ, Fernandes Moça Trevisani V. Diacerein for osteoarthritis. Cochrane Database Syst Rev. 2014 doi: 10.1002/14651858.CD005117.pub3. Jain A, Mishra SK, Vuddanda PR, Singh SK, Singh R, Singh S. Targeting of diacerein loaded lipid nanoparticles to intra-articular cartilage using chondroitin sulfate as homing carrier for treatment of osteoarthritis in rats. Nanomedicin e. 2014;10:1031-1040. McAlindon TE, Bannuru RR, Sullivan MC, et al. OARSI guide lines for the non-surgical management of knee osteoarthritis. Osteoarthritis Cartilage. 2014;22:363-388. Chinese Society of Orthopaedics, Chinese Medical Association. Guidelines for the diagnosis and treatment of osteoarthritis (2007). Zhonghua Guzhi Shusong Zazhi. 2007;27:793-796. Kooistra BW, Spraque S, Bhandari M, et al. Outcomes assess ment in fracture healing trials: a primer. J Orthop Trauma. 2010;24 Suppl 1:S71-75. Bellamy N, Buchanan WW, Goldsmith CH, et al. Validation study of WOMAC: a health status instrument for measuring clinically important patient relevant outcomes to antirheumatic drug therapy in patients with osteoarthritis of the hip or knee. J Rheumatol. 1988;15:1833-1840. Chen Q, He B, Wang YH, Fan L. Clinical observation of dia cerein combined with celecoxib in the treatment of knee osteoarthritis. Shiyong Guke Zazhi. 2010;16:894-896. Liu GB, Zhang GP, Ren QY, et al. Classification of ankle in jury on radiography and magnetic resonance imaging: study protocol for a retrospective, self-controlled, clinical trial with 3-month followup. Clin Transl Orthop. 2016;1:170-176. Chen Y, Qu S, Ma G, Meng JH, Ni XL. Femoral nerve block prevents deep venous thrombosis of the lower extremity after knee arthroplasty: a single-center randomized controlled trial. Clin Transl Orthop. 2016;1:1-5. GDW and LYY conceived and designed the entire study and wrote and reviewed the article. BH provided constructive suggestions. YHW and QC will assist LF in performing the trial. All authors approved the final version of this article. The study was approved by the Ethics Committee, Second Affiliated Hospital of Nanjing Medical University of China (approval No. (2017) KY-091). The study will be performed according to the Declaration of Helsinki and relevant ethical principles. The authors certify that they will obtain patient consent forms. In the form, patients will give their consent for their images and other clinical information to be reported in journal(s). The patients will understand that their names and initials will not be published and due efforts will be made to conceal their identity, but anonymity cannot be guaranteed.